Nickel-cadmium and lithium-ion batteries can't simply be thrown away—their dangerous heavy metal contents could leak and contaminate the environment. Problem is, batteries have to be sorted by size and type before being recycled, which is both labor-intensive and time-consuming. Luckily, this high-speed battery separating system is anything but manual. It's called the Optisort. Developed by Claes Strannegård, an AI researcher at the University of Gothenburg, in conjunction with Renova, a Swedish recycling company, it can identify nearly 2,000 different types of battery—from alkaline button cells to Li-ion cell phone packs—and sort them all based on their individual size and chemistry. This system is even able to differentiate within a battery family, separating Ni-MH from Ni-Cd with ease. 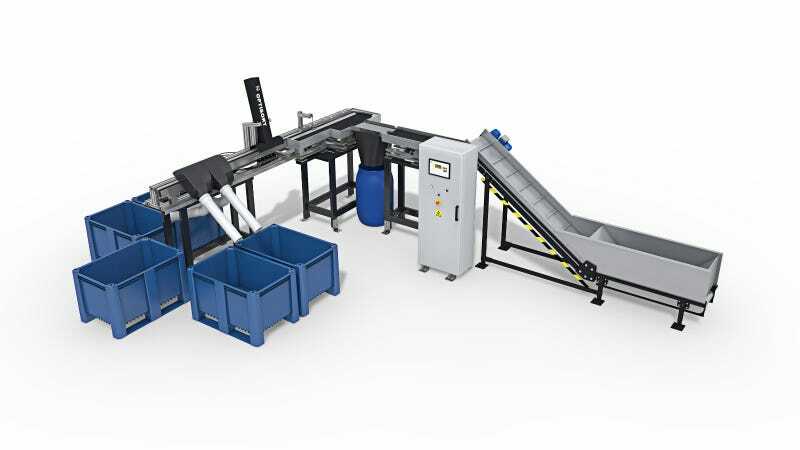 What's more, the Optisort is as accurate as it is fast, separating up to a tonne of dead cells every hour—that's 10 batteries per second—with 98 percent accuracy. Incoming piles of mixed batteries arrive via a high-speed conveyor belt. As they pass under the Optisort, each one is photographed by the machine's camera and matched to a verified example from the system's extensive image database based on various physical characteristics like shape, color temperature, and logo. By utilizing a neural network architecture to enhance its recognition speed, the system can positively identify batteries even if they are damaged. Once identified, the battery is then pushed off the belt into a sorting bin by a jet of compressed air and its image is added to the database. The more batteries that the system sees, the more accurate it becomes.